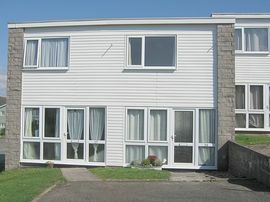 Peter and Barbara will be pleased to welcome you to our recently refurbished cosy Holiday Homes number 28,42,& 245 Freshwater Bay Holiday Village,(also known as Trewent Park). 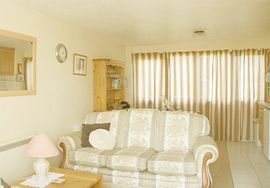 Freshwater Bay Holiday Village in the Pembrokeshire Coast National Park is a very short walk from the beautiful safe, sand dune backed beach of Freshwater East. The homes are 'open plan' downstairs with living, dining and kitchen area. 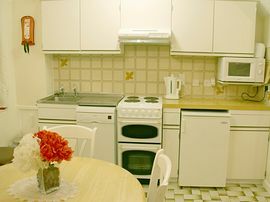 The fully fitted kitchen includes a full size electric cooker with oven,(No.28 has a dishwasher), fridge with small freezer compartment, microwave and toaster etc. 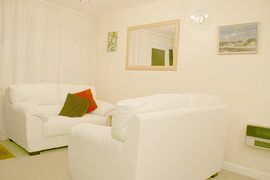 The lounge/dining area has a table and chairs seating six, comfy sofas, TV with Sky freesat and a DVD player. Upstairs there are two bedroom and a bathroom with bath with shower over. Bedroom one in all three properties has a double bed, chest of drawers and wardrobe. Bedroom two No.28 has twin beds,(2ft.6ins. x 6ft.3ins). Bedroom two No.245 has bunk beds,(3ft.x 6ft.3ins). The bedrooms and bathroom have fixed wall heaters and a fixed hairdryer on the landing. There is parking in numbered bays outside the property. Please note the site is 'dog free' so unfortunately pets are not allowed in the accommodation or on the site. The Longhouse is a restaurant/bar on site which is open during the main holiday season,there is also a small shop on site, also open during the holiday season. At other times there is very good food to be found at the local pubs. Freshwater Bay Holiday Village in the Pembrokeshire Coast National Park is a short walk from a beautiful, safe, sand dune backed beach of Freshwater East, the beach slopes gently making it safe for children,there are many rock pools to explore and large area's of sand for beach games, in certain weather conditions the sea is ideal for body boarding or surfing,and as the sun sets you will find fishermen trying to catch their supper. The Pembrokeshire Coastal Path passes the front of the site which afford good walking or short strolls with fantastic views. The local Coastal Cruiser bus stops by the beach and will take you to many local beaches and villages. South,and the wonderful beach at Freshwater West. is 4 miles both by car. Other local places to visit include Bosherston Lily Ponds, Caldy Island, Lamphey Palace, Folly Farm Adventure Park, Ritec Valley Quad Bike Centre, Manor House Wildlife and Leisure Park and many historic castles. Pembrokeshire is a wonderful place to get away from it all, unwind and enjoy the natural beauty of the area. Short walk to a wonderful sand dune backed beach. Good for walking the Coastal Path, for long or short walks. .
We provide all bed linen,duvets and pillows,all you need to bring your own towels. We also provide you with washing up liquid,tea towel and cleaning products. The site is dog free so unfortunatly pets are not allowed in the accommodation or on the site. Please no smoking within the property. Well maintained lawned area's for quiet relaxing.Parking right outside the Holiday Home. Local Services: Local Coastal Cruiser bus service passes the park entrance. From Camarthern take A40 west bound to Pembroke Dock at end of duel carriagway turn left onto A477 towards Pembroke Dock. Next two roundabouts straight over, next roundabout straight over on the A477, at village of Milton you need to turn left on a minor road,(by the farm shop) towards Lamphey, follow until 'T'junction turn right follow to Lamphey village, at 'T' junction turn left go past church,over bridge, take a right turn on the bend then immediatley left on to the B4584 to Freshwater East. In Freshwater East just past bus shelter (on your right) turn right down Trewent Hill at the bottom past car parks go over small bridge, Freshwater Bay Holiday Village is on your right,(also known as Trewent Park), go past wooden coloured house our holiday homes are the white properties. . Please ring for special Christmas/New year offer. Our Holiday Homes are available Saturday to Saturday, from 3.00pm on your first day and depart by 10.00am on your last day. 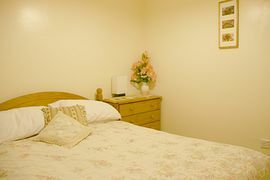 We offer special prices for couples at certain times please ring 01989 562836 for details.